front I started this quilt an embarrassingly long time ago at a Guild mystery quilt workshop led by Arlene MacKenzie and Kelly English. We were to bring a bunch of coordinating fat quarters plus one metre of another fabric. I had enough batiks on hand that all I had to do was buy a metre of the dark green inner border and set aside a pile of other batik (mostly yardage). Biggest challenge before the workshop? Not cutting into the dark green for other projects. The great thing about an Arlene and Kelly workshop is that they really give individual attention. Even before we made the disappearing 9-patch in the centre medallion, Kelly was going round the tables, asking each of us which of our fabrics we really wanted to show off and advising which ones to set aside for later blocks where larger pieces would be needed. So everyone got to make a unique quilt, (except one enthusiastic over-achiever who went home and started a second mystery quilt using different fabrics in the week between the two classes) and I don’t think anyone was left with the feeling they would have made vastly different design decisions than they did. So, what do you think? 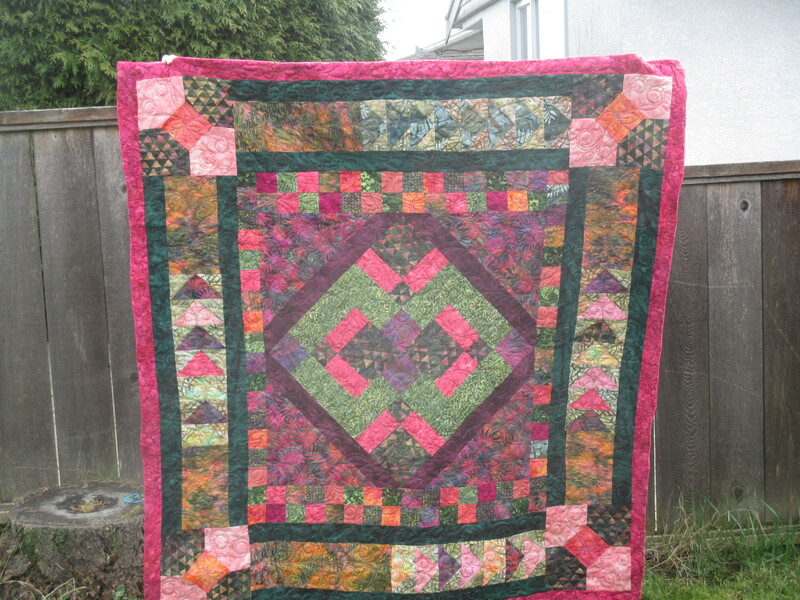 Have you done a mystery quilt and were you happy with it? Would you do it again? We are so blessed that Bib N’Tucker has the biggest batik selection in western Canada — and is poised to open in more spacious premises very soon. 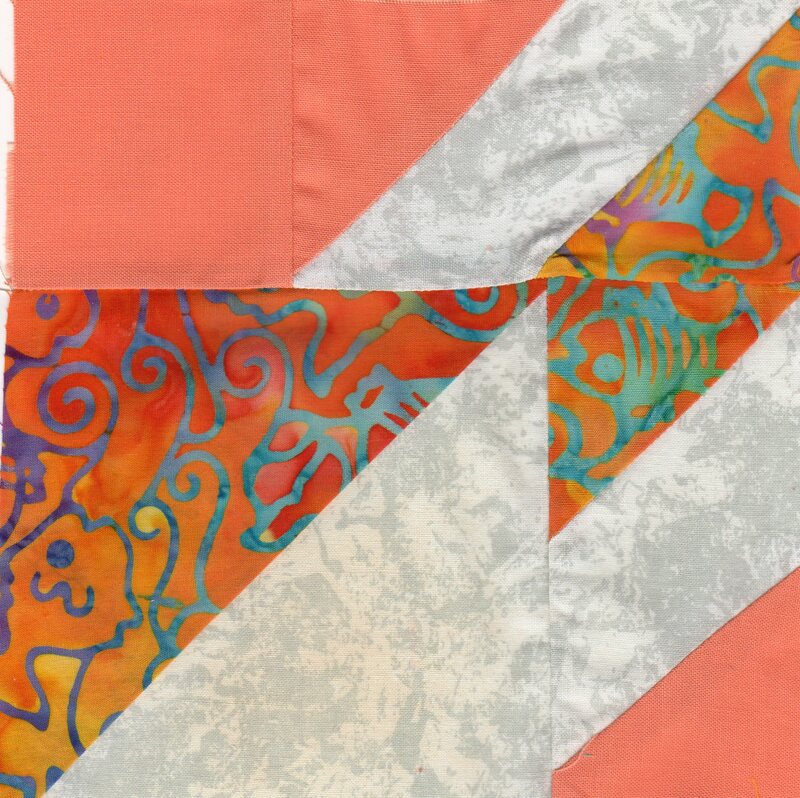 shows the African design with Zentangle-esque pattern elements, which has been overdyed with a low-immersion technique. 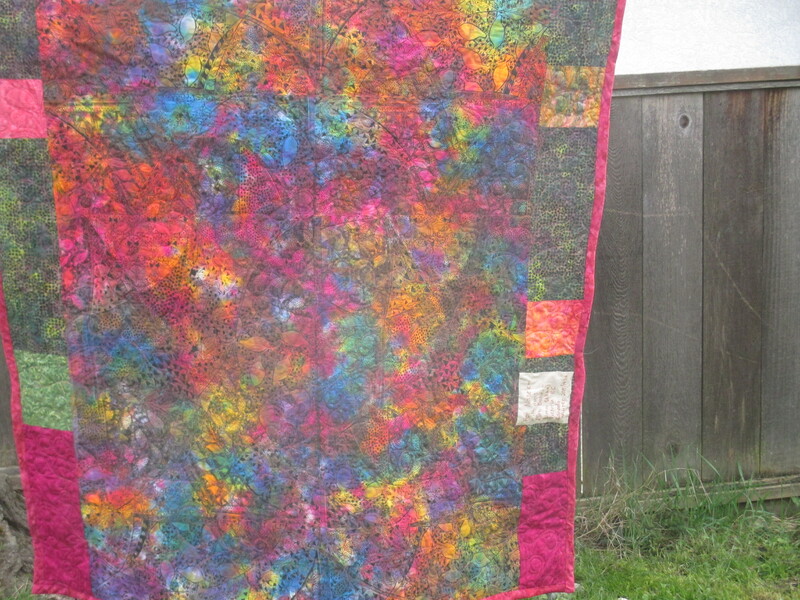 and showing Arlene’s beautiful long-arm quilting too. This was too gorgeous to attempt to do on my home sewing machine. Use What You Have – Got Stash?? well, this is embarrassing! 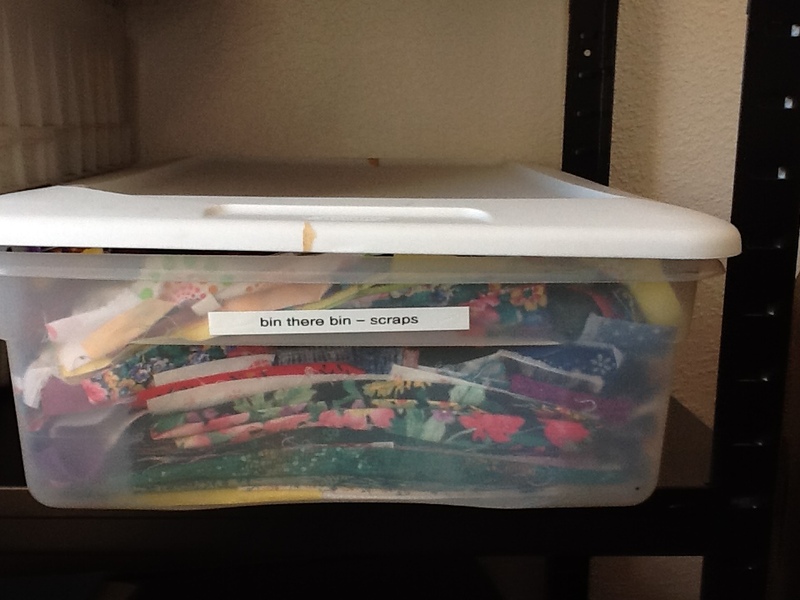 I knew I had a lot of scraps — defined below — because I had a large tote bag stuffed full, plus some that overflowed onto the floor, plus an open medium size moving box that the tote bag sat in also containing scraps. Making slabs to recover southern Alberta inspired me to tidy and organize them. I emptied the bin in the photo above by consolidating some dyeing fabric and blank white garments which easily fit into a single bin, then started folding and laying scraps in. Now the tote bag is empty and the box is nearly but not quite empty. What an eyeopener! This is the wake up call. I could make a slab a day for the rest of my life just out of this bin. and the slabs would be colour coordinated too! batiks for the prairie points on the dino quilt that coordinates with this pillowcase. The bin is on a shelf at waist height where I will see it and be able to reach it easily. Of course, tidying one thing led to another and I have plenty of batting too, now consolidated into a Rubbermaid roughneck tote bin and a moving box. And there is a little more floor space free than before. Does anyone else have this problem? What are you doing about it? The bin there bin really is just that. It seems that there are very few fabrics which I’ve completely used up. 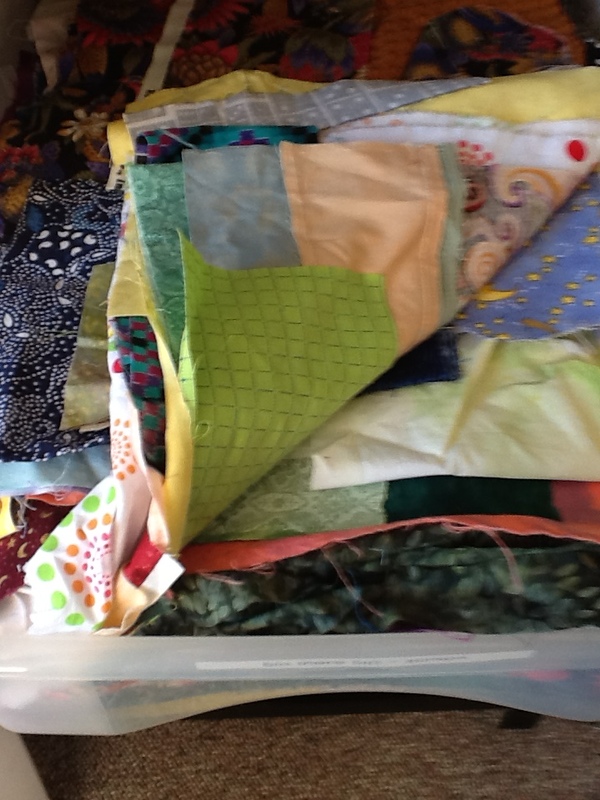 This represents 15 years of quilting but I can see the next 15 years are already right here! And in the very first class the teachers warned us about this, but who listened, LOL? fat quarter with a chunk cut out of it, because of the number of times when I’ve been preparing for a workshop that calls for fat quarters only to discover the dreaded missing corners! Of course there’s never a good time for a sewing machine to be temperamental, but in the middle of sewing the binding onto a quilt that has to be delivered this weekend because the recipient is about to move overseas is one of the worst times. What a blessing that the awesome ladies at Satin Moon Quilted Garden agreed to clear off a table so I could use one of their machines. This despite having the store full of the Christmas Bazaar handcrafts at the front, and the classroom/sewing area temporarily well filled with notions. They even spoiled me with fresh coffee, which really hit the spot! Thank you Linda, Susan, and Maureen! So: Mission accomplished, now I just have to sew the back down and do the label. This is something no one can compete with online. Local independent retailers bring so much to our communities in service, support and character. Mindful of the need to show support, and aware of the excellent specials that were on, I indulged did my bit for the local economy: isn’t this pear batik drool-worthy? The Memory, Family, History art show opened at Coast Collective last Saturday afternoon. This was a great opportunity to meet other local artists and see what people are doing. Only two fibre art pieces are in the show, my “Enuff on My Plate,” and Laine Canivet’s “Rock, Paper, Scissors.” Laine wasn’t in town, so I was the sole fibre artist in attendance. I was amazed at how impressed everyone was with the idea of making art in fabric. One lady said “So you painted the chefs onto the fabric?” I had to tell her it was all in the shopping. Which is true, someone else might not buy that fabric, and another person might buy it and just make napkins and placemats. The painting below my piece, “Womens’ Work” by Suzanne Jensen, also deals with similar concerns. The painting is of a young woman in a construction site, but Suzanne gessoed doileys made by family members onto the canvas before she started painting, to reflect different types of womens’ work. Several women said they could relate to my title! One neat thing about this particular exhibition was that the artist statement prompted everyone to write a narrative explaining about their work and its significance to them personally. This added a lot to the show and encouraged lingering and paying more attention. Imke Pearson, Kate Seymour, Sheryl Gusauskas, Robert Anderson, Vicki Postl, Karen Furey, Suzanne Jensen, Lorraine Thorainson Bettes, Deborah Czernecky, Radmila Gorjanovic Nunez, Rachel Windson Lawson-Gurevitch, Lisa Riehl, Linda Simrose, Marcela Strasdas, Rose-Anne Matte-Munro. My contribution to the refreshments was applesauce gingerbread from Joy of Cooking. This was the first time I made it and it was all eaten up. At home we are seriously trying to cut back on refined sugar and starches, but as cakes go, I would think this is fairly healthy. The afternoon was enjoyable and somewhat compensates for the disappointment that my piece for the Elements show was not hung. I need to make smaller pieces I guess. And that is a question of developing the techniques to be able to do that. In a discussion on size with painters at the opening I pointed out that larger pieces are harder to sell because they are harder to display. It’s not just a matter of price but of having a space that you want to transform with that particular piece. Both the artists said that had not occurred to them before! Maybe it’s because quilting and fibre arts are so linked to decorating and home-making, that gives us that more practical perspective. Of course no trip is complete without a detour and Saturday was no exception. My strategy was to go as far west as possible by bus and then take a cab. The bus stopped right by Cloth Castle and I was in TONS of time, so of course I got off to explore, YAY! This was my first time there, and I was pleased to see they have some items not available at other local stores, plus the bargain attic. The fabric I bought is shown above. I’ve already used some of the blue and yellow stars in the baby quilt. 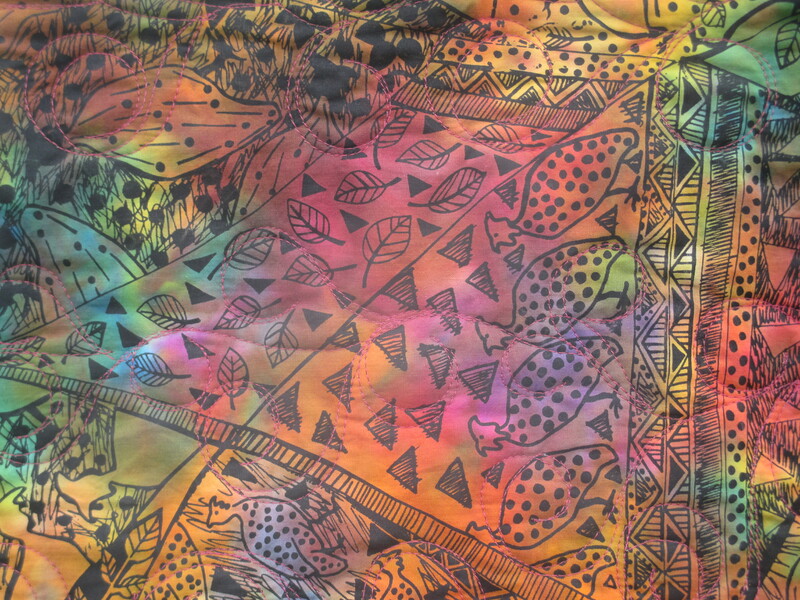 It’s a batik-style fabric. 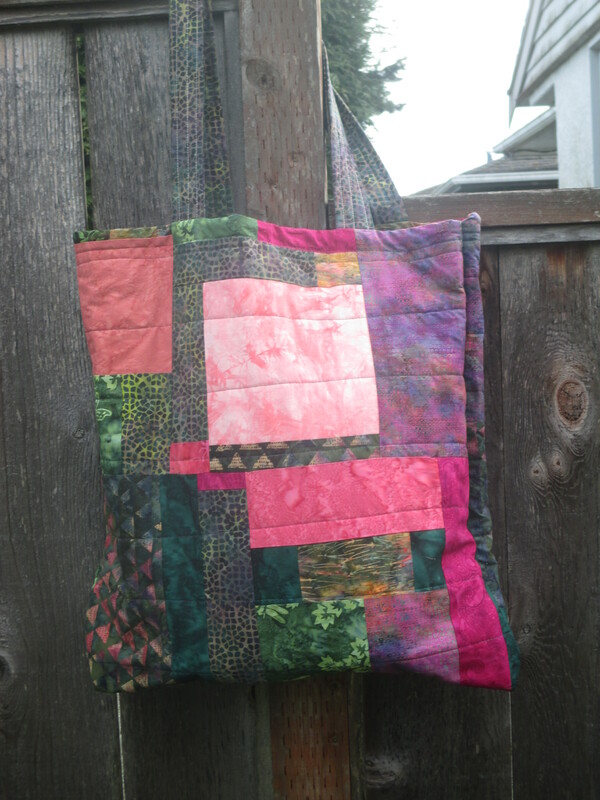 The multicoloured fabric has machine stitching on it, that is not printed loops. And I have in mind to use the top one for backing. I’m a big fan of unconventional stripes. They do say that the mark of a good composition is one that works in any orientation, so perhaps I’ve achieved that for once. While in the workshop with Susan McGregor at Satin Moon last week, I felt that the piece would be turned this way (second photo). That was how her sample piece was displayed and I was not aiming for a landscape effect, just wanted to learn the technique and play with the subtle batik colors. At the end of the day, Susan and I were looking at my work and she suggested turning it sideways, (third and fourth photos). At home I thought about it some more, and discussed with a family member, and we decided that the third photo was most suggestive of a landscape. Based on that, I laid a piece of fusible embroidery thread across the bottom of the piece and fused it on to use as a cutting guide. This piece is still not finished because as mentioned earlier it’s to be embellished. While talking about the logistics of embellishment with fellow FAD members, people challenged me to hold it up in different orientations to rethink it, and I’m now leaning towards the last photo, with the curved edge at the top. Who knows, perhaps in the course of embellishing some other epiphany will come? But I’m thinking to take that as the orientation for the embellishment. In any case, this technique, which is topstitching the curves and matching the top thread to the fabric (in most cases) has many possibilities and I plan to play and experiment. 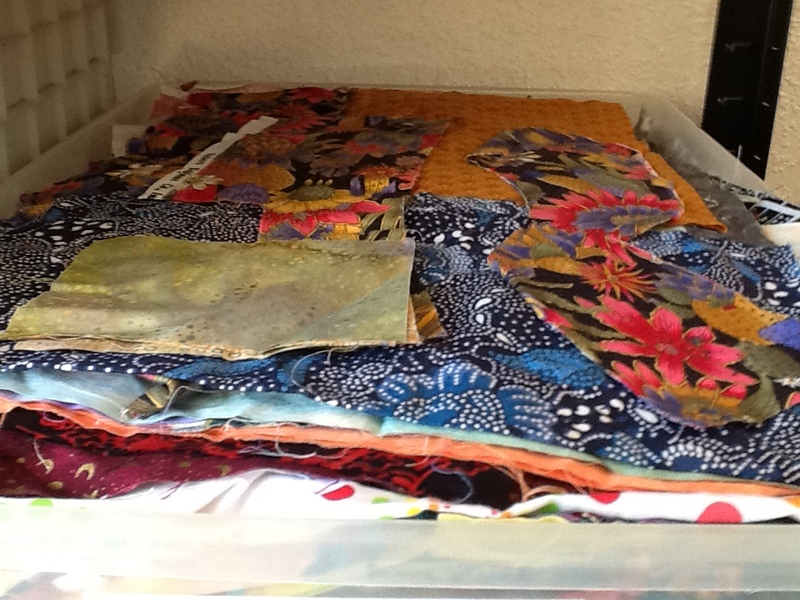 Although my stash doesn’t contain that much batik, I’m thinking paisley prints, commercial marbled fabric like Moda, and some of my hand dyed fabric. So I look on this piece as the first of many ~ this is a great technique to have in the repertoire.